Before science, before history, an era of magic existed in our world's dim past. Magic flowed freely, touching every aspect of the lives of men and women of the Namegiver races. It was an age of heroes, an age of fantastical deeds and mythical stories. It was the Age of Legend. Now, bold heroes from across Barsaive band together to fight for life and freedom against the remaining Horrors and the oppressive Theran Empire, which seeks to bend the rebellious province again to their yoke. Through noble deeds and sacrifice, the heroes of the world forge Barsaive's future, arming themselves for their daunting task with powerful magical spells and treasure. Eathdawn is a roleplaying game set in a world of high adventure, high magic, and terrible danger. 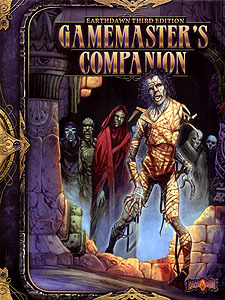 The Gamemaster's Companion expands the rules in the Gamemaster's Guide, providing new game mechanics, extended setting material, and adding more creatures, dragons, Horrors, Spirits, and unique magical treasures!